Madagasikava is what the country is called in their native language, Malagasy. The name Madagascar is likely a mistake made by the Venetian explorer Marco Polo, back in the 13th century. It is believed that Marco Polo thought he was referring to Mogadishu, when he wrote Madagascar, in his journal. The letter “c” is not used in the Malagasy language. However, the error was made and that is what this island nation is called today. It was also known for a time as St. Laurence, after a Portuguese explorer, who landed on the island on that day in 1500. Sometimes the island is referred to as the “Red Island”, because that is the color of the soil in many parts of the island where slash and burn agriculture, has left the land bare. Madagascar is the fourth largest island in the world. It is located in the Indian Ocean, off the southeast coast of Africa. The island nation includes numerous peripheral islands, as well. The main island is about 1000 miles long and 350 miles wide. It is believed that this island split originally from the prehistoric supercontinent, called Gondwana. Then some 165 million years ago split from Africa and 88 million years ago separated from India. Due to this most unique circumstance, native plants and animals have evolved in relative isolation from the rest of the world. It is a biodiversity hot spot. Some ecologists refer to it as the eighth continent. Over 90% of its wildlife is found nowhere else on earth. Its closest neighbors are the islands of Mauritius to the east, Comoros to the northwest and Mozambique, the nearest mainland, located to the west. It is believed that the first human settlements occurred between 350BC and 550AD by Austronesians who arrived on the island in outrigger canoes from Borneo. Other groups followed over time. There are 18 or more subgroups considered to be Malagasy that make up the majority of the population. The largest are the Merina of the central highlands. Each subgroup has contributed to the cultural heritage of Madagascar. Beginning in the early 19th century most of the island was ruled as the Kingdom of Madagascar, by Merina nobles. The monarchy collapsed in 1897, when the Island became part of the French colonial empire. It remained in the hands of the French until they gained independence on June 26, 1960. Since independence, they have had four major constitutional republics. Constitutional governance was just recently restored in January 2014, when Hery Rajonarimampianina was named president. This was after the international community deemed the election fair and transparent, since corruption has been a major problem in this country. The population is over 22 million. It is estimated that 90% of the population, live on less than $2 per day, making Madagascar one of the poorest nations on earth. They hope that ecotourism and agriculture, along with investments in education, health care, and private enterprise, will lift the people out of poverty. The two official languages are Malagasy and French. Antananarivo is the political and economic capital of Madagascar. It is located in the highland region, near the geographic center of the island. It was founded as the capital in 1610. The main religion is Christianity, along with traditional beliefs, which have been passed on by their ancestors. The sacrifice of the Zebu (a species of humped cattle that is used for meat, milk and work,) is a method to appease and honor the ancestors. Islam is also practiced by some seven percent on the island and was first brought there by Arab and Somali traders in the Middle Ages. More recently Hinduism was introduced and is practiced by a small minority of the Indian population. Madagascar has lost nearly 90 percent of its forests. It is struggling to find a balance between the environment and traditions of its people. It also suffers from destructive cyclones. Some of the wildlife, like the lemur, which may be their most famous animal, is on the verge of extinction. There are over 100 known species and subspecies of lemur that are found only on Madagascar. There are a number of other mammals that are endemic to Madagascar, such as the cat-like fossa. Some researchers believe that Madagascar is the origin of chameleons, since they are home to two-thirds of the world’s species, including the smallest chameleon known to exist. Madagascar is home to nearly 15,000 plant species, of which, 80 percent, are found nowhere else in the world. Three quarters of the 860 orchid species and six of the world’s nine magnificent baobab tree species, are only found in Madagascar. These trees can reach 36 feet in diameter and 98 feet tall. There is an area in western Madagascar called “The Avenue of the Baobabs.” It is a very popular destination for visitors from all over the world. Some of these trees are estimated to be 800 years old. The Malagasy call them renala, which means “mother of the forest.” It has 165 of the known 170 palm species, nearly three times as many species then found in all of mainland Africa. The iconic, giant travelers palm is featured in the national emblem. Despite this area being a popular tourist destination, it has not been declared a national park and there are no gate fees or visitor centers. Many plants in Madagascar are used as herbal remedies. The drugs vinblastine and vincristine, were made from the Madagascar periwinkle, and are used to treat Hodgkin’s disease, leukemia and other cancers. Healthcare in Madagascar is found mainly in the urban areas, leaving the vast majority of the population to find help from traditional healers. Madagascar is blessed with natural resources, which include agriculture and minerals. Agriculture, fishing and forestry are the backbone of the economy. They are the world’s supplier of vanilla beans, cloves, and ylang-ylang (the oil of which has many medicinal properties.) Coffee, lychee fruit and shrimp are also important products for export. Most of the population works in agriculture. Madagascar currently provides half of the world’s supply of sapphires, which were only recently discovered in the late 1990s. There are many mining projects underway and there is hope that oil and gas may give a big boost to the economy. One can only hope that the relatively new government will end corruption and make the right choices for the people of Madagascar. As we look into the cuisine of Madagascar, it is mainly influenced by what is available locally and of course the French. Southeast Asians, Africans, Indians and Chinese all have influenced the cuisine as well. Rice is certainly considered the mainstay and served with nearly every meal. All sorts of sauces, called laoka, are made to accompany the rice. 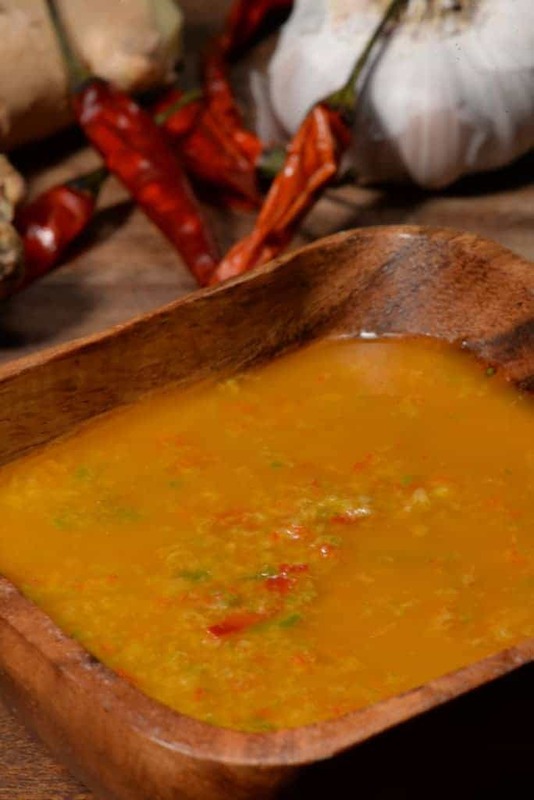 Typically a sauce will be enhanced with the flavors of ginger, onion, garlic, tomato, vanilla, salt and curry powder. Beef, chicken and pork are available, along with all sorts of seafood found along the coast. Vegetables, like green beans, cabbage, carrots and onions, are abundant. Also in the arid south and west, cassava, sweet potato, yams and taro root are staple ingredients. Peanuts are often used in the dishes, as well. All types of fruits, both temperate and tropical, are found and loved in the cuisine. The food is typically served with a condiment called sakay on the side, which is a spicy sauce made from red or green chili peppers. It is added to the dish after the food is cooked so the individual can adjust the heat, according to their preference. Street foods are also popular and they are called mofo, which means, bread. These treats can be made plain, with coconut milk or with fruit. There are endless combinations of mofo. 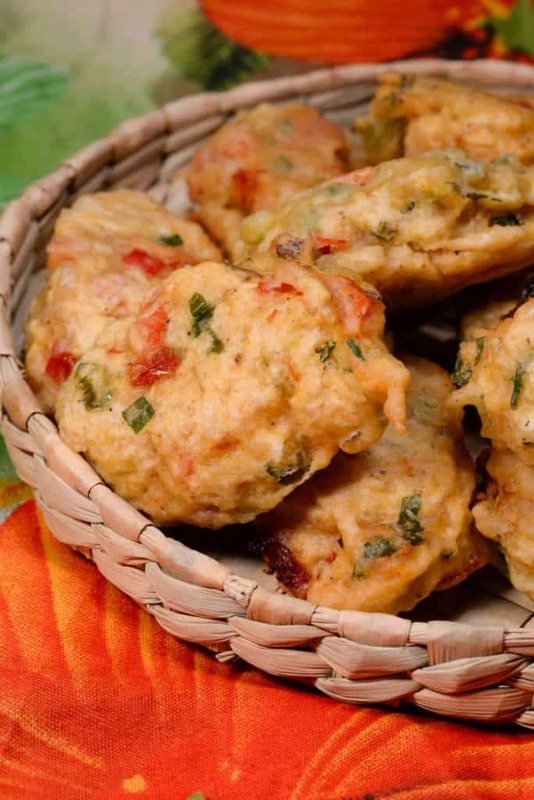 The fried fritters are made from a sweetened rice batter and flavored with chopped greens, such as watercress, onions, tomatoes and chilies. This style is called mofo sakay, meaning, spicy bread and is how we began our Malagasy meal. We set the table with a colorful cloth that had flowers and palms on it, to represent the biodiversity in Madagascar. 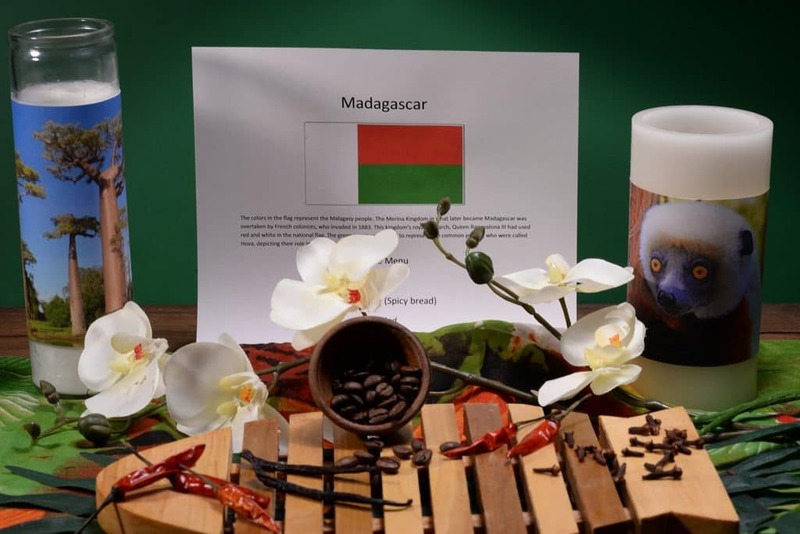 We added vanilla beans, cloves and coffee to signify their main exports and of course a picture of a lemur. (Our cat Buddy sort of reminds us of a lemur, with his great big eyes!) Beautiful orchids completed the setting. The first course was the typical street food described above, called mofo sakay. We loved these little, fried, spicy treats. We enjoyed them with an ice cold beer. They make a few different beers in Madagascar, the most popular is called “Three Horses Beer” or THB. A popular non-alcoholic drink is called ranonapango, which is made in an unusual way; after a pot of rice has been overcooked, boiling water is added to the pot to get the flavor. The water is then chilled and served cold. Some say it is an acquired taste. But speaking of drinks, rum is the most popular alcohol consumed and is made from sugarcane. When a new bottle of rum is opened, a capful is thrown in the corner of the home, to honor their ancestors. Up next, we enjoyed an avocado salad. 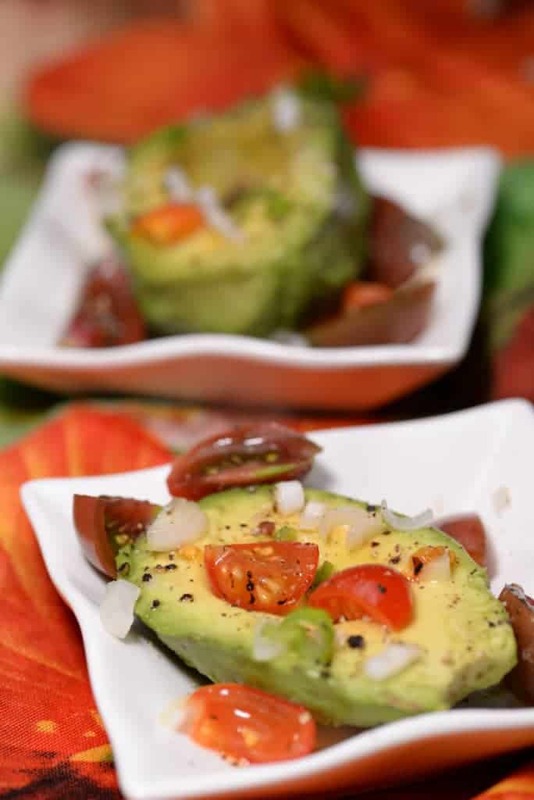 We used the avocado as the vessel to hold the onions and diced tomato. It was lightly dressed with a little olive oil and lemon juice and a dash of vinegar. It was a light and lovely salad. For our soup course, we had a hearty, pureed vegetable soup, called lasopy. This vegetable soup is usually made with pork or meat bones to flavor the broth, but of course you could use a vegetable stock, if you prefer. 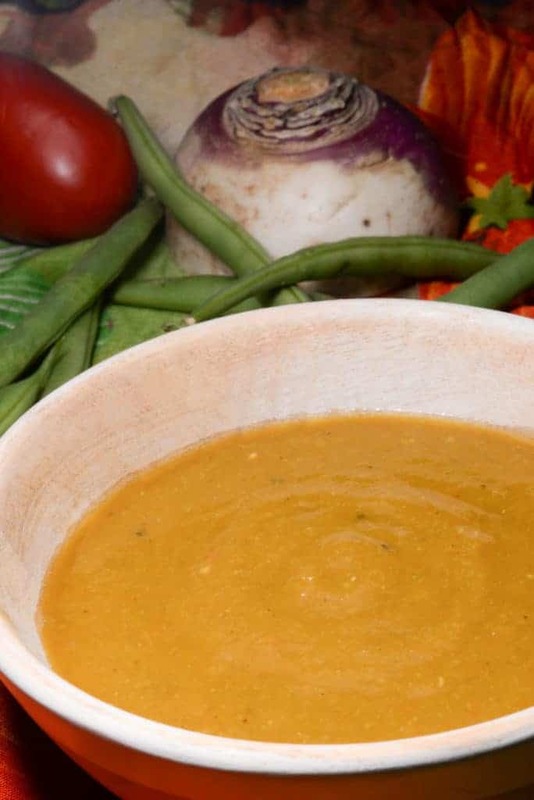 This soup is made with whatever vegetables are fresh and in season. We got all of the ingredients for this dish straight from our International Cuisine garden, which is abundant now that summer is in full swing. The vegetables are cooked and then put in a blender to puree. The soup and is served alongside a baguette of french bread and some sakay. Their cuisine is pretty bland as cooked, until you add sakay. This is a spicy condiment made of thai chili peppers that is found on every table. The sakay livens every dish up beautifully. For the main course, we made Madagascar’s national dish called romazava. 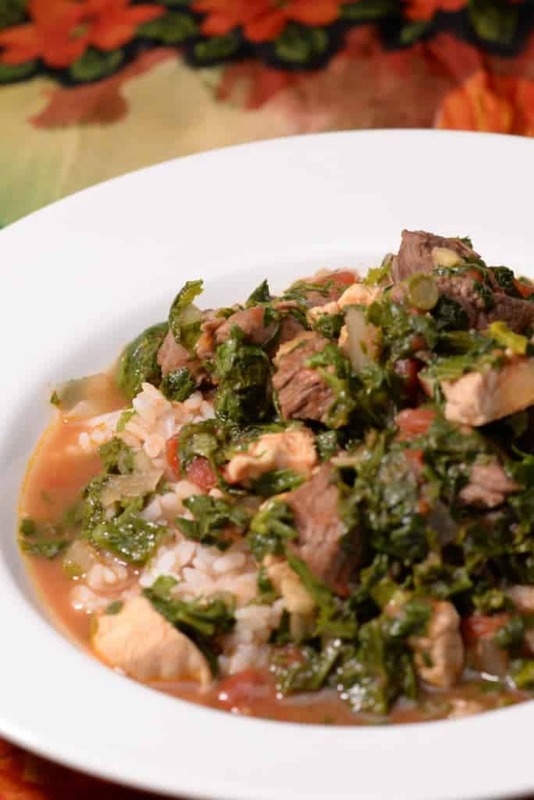 This is a meat stew with fresh greens. It is typically served over rice and can be a one-course meal by itself. It is hearty, as it contains three different types of meat; beef, chicken and pork. Certainly, romazava can be made with just one type of meat, Zebu cattle is most often used. The greens are also very important elements to the dish. The recipe calls for a green anamamy, which sometimes goes by the name, Malabar spinach; however, any spinach will work as a substitute. Mustard greens are easy to come by and add a nice peppery flavor to the dish. Paracress is a tough green that grows there. It is known as the toothache plant and will numb the mouth completely, like a local anesthestic. It is perhaps this green that makes the dish famous as the national dish. The best we could do was to substitute arugula for the flavor of paracress, without the numbing affect. We enjoyed this hearty stew with plenty of sakay. For dessert, we went the French route, using one of Madagascar’s most famous ingredients, the vanilla bean. 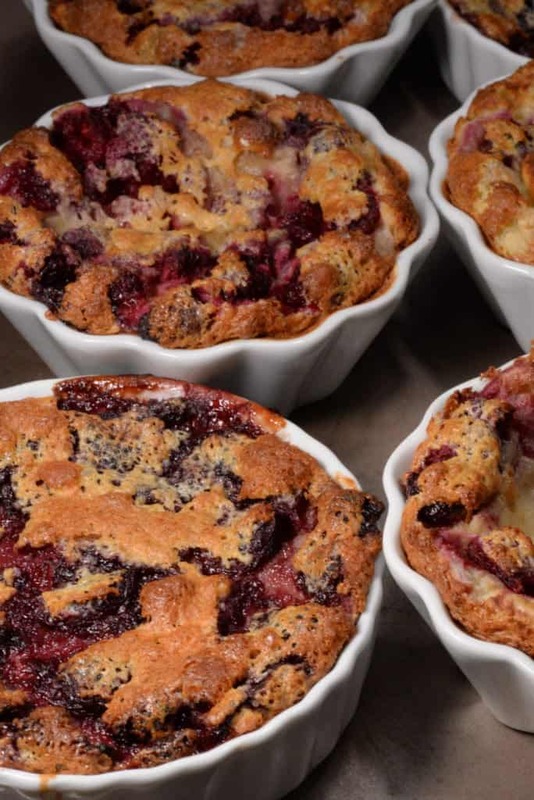 We enjoyed a vanilla bean, fruity, clafouti. These little custards were made with sweet cherries and the dessert was a lovely ending to our Madagascar meal. Next, we were off to relax in front of the television, as I rented, what else, but the Dreamworks, animated film titled, “Madagascar”. “Life is a shadow and a mist; it passes quickly by, and is no more. Mandra-pihaona, which means “see you later” in Malagasy. The history as you explained is so interesting. Of course, when I think of Madagascar I think of vanilla beans and the wonderful vanilla produced which I commonly use. Your pictures of the food are beautiful and now I want to make each dish! So glad you enjoyed it Mlss! Those vanilla beans are pricey but a must have for authentic delicious flavor. The cuisine of Madagascar, it is mainly influenced by …..Southeast Asians Yes. Indonesia.Thank you! Yes indeed, Loved it, thank you Gatot!